Without the Veil Between, Anne Brontë: A Fine & Subtle Spirit? Would you like to win a lovely, limited edition prize? Contest! Review “Without the Veil Between” and Enter to Win! Deadline extended to Anne Brontë’s birthday, January 17! that you have written and posted a review and where. Or contact me to let me know. It was November 24, 1834. Emily Brontë was sixteen, her youngest sister Anne fourteen, when they wrote the first of their diary papers (this one jointly, although it is thought the majority of it was Emily’s doing, noting the use of the pronoun “I”, the references to Anne, the run-on sentences and spelling errors, and the sudden slip from reality into fantasy: Gondal). These are the kind of tidbits from the past that inspire my writing the most, coming, as they do, out of everyday, intimate moments in time, very ordinary and uneventful, but, also, extraordinary, revealing, and, certainly in this case, poignant considering these two adolescent girls living in the moment with such innocent hopes for the future … that never came. Have you purchased your copy of Without the Veil Between: Anne Brontë, A Fine and Subtle Spirit yet? Have you read it or is it on your TBR list? I’m running a contest for anyone who posts a review on Amazon and/Goodreads and/their blog before December 31, 2018. Follow link or click on image below for more details. Diane Denton has narrated, through Anne’s sensibility, the cruelest yet most beautiful part of this remarkable family’s story. go to: Contest! Review “Without the Veil Between” and Enter to Win! The holidays are coming! Have some Brontë aficionados on your gift list? that are available for purchase. 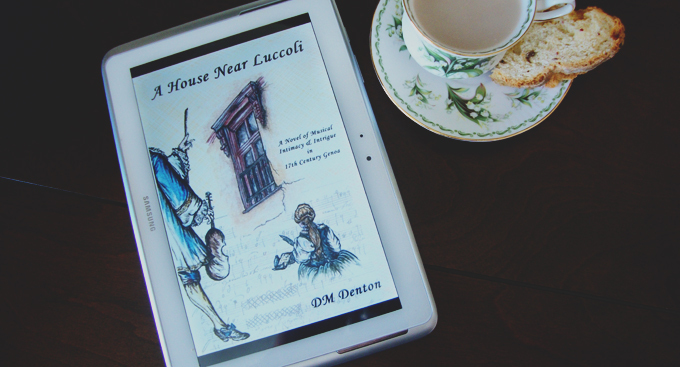 Even after almost four years, it’s so thrilling to know that my novel A House Near Luccoli is still finding new readers. Thank you to Christoph Fischer, who is a very fine writer himself, for taking the time and interest in engaging with the novel and writing such a beautiful review. While you’re visiting his site, please take a look at his excellent publications. 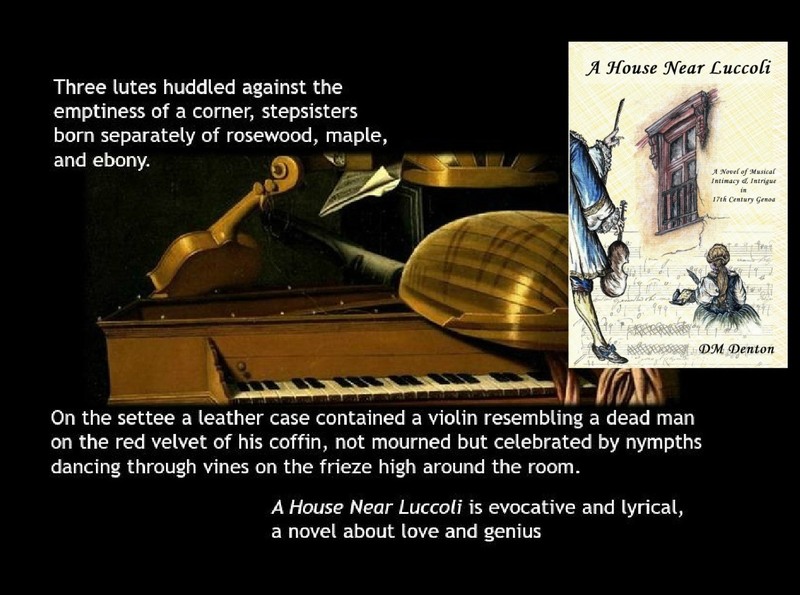 A most beautiful and engaging novel about Baroque musician Alessandro Stradella. Mixing fact with fictional elements we get to witness this colourful and fascinating subject in his professional and private life. The flow of the writing is smooth and pulled me in from the first chapter – something that few historical novels master. The prose is wonderful and the pace just perfect. There is a great story to tell about this man and the music world of the 17th Century. I was amazed at how much I enjoyed this novel, being not that familiar with the Italian Baroque ‘scene’. The author has done immaculate research and fills the pages with great details without overloading it. She didn’t fuss with her hair or use the vain clutter of the dressing table except to waste time rearranging it. Eventually she turned to what was behind her. Laid over a small unmade bed and the chair beside it were two fancy gowns, creased and dated, suiting a younger shape and needing somewhere to go. She was sure she wouldn’t wear them again. The lace might be salvaged, for she couldn’t be without lace, at least around her neck and, at most, edging her sleeves as well. Otherwise she dressed serviceably, invisibly, in gray or dark blue. She no longer thought of being bolder or more submissive or, in a city on a bay-becoming-the-sea, swept away at last. It was as if someone else recalled a ship, who sailed on it, and walking down a shady alley with a stranger. There was always the temptation of mixing imagination with reality, especially as the past was otherwise inalterable. Her reflection was plain in the mirror, her hair quickly pinned, her face flushed. She moved to a corner table, begging light from a narrow window, cleaning brushes and closing colors yet to finish curled pictures of spring or begin the next season before it did. She had painted in brighter places, dreamed in them, too, and didn’t care who saw her as a dreamer, until she committed herself to being withdrawn and forgotten like a lunatic huddled in a corner, hardly knowing the difference between a smile and a frown. She took the green dress off the bed and pretended to wear it for a small stroll around the room. Then she walked into the hall as if out into the city; her city, at least, as it was also born of land and sea, formed by highs and lows, ruled by outer constraint and inner abandon, safe and sorry in disguise. Of course Genova had a conceit she couldn’t have, knowing its purpose and hiding or flaunting its features of beauty. Once she saw all its wonders and woes from the esplanade of Castelletto, the mountains closer and the Lanterna further away. Perhaps she made out her house; if not its signature portal of Saint George and the Dragon, then a signifying shine on its roof’s slant. It was a prestigious place to live depending on how she looked at it, whether connected up to a parade of palaces, across divides or down crooked stairways to the port. She was patron and prisoner of a gated entrance and more rooms than the closeness of the surrounding dwellings allowed, aspiring staircases growing them similarly into multiple stories. She could have done without so much unused furniture, mirrors, and silver to be cleaned but was greedily accustomed to a tenanted wealth of paintings, tapestries, frescos, and stained glass not created for outside views. Donatella had barely reached the doorway of her bedroom, throwing the dress in, not caring where it landed. “Oh, it’s so sudden.” Her aunt gave her a key and feather duster for gentler work than Nubesta carrying broom and bucket, hastening an end to the long vacancy of the third floor apartment, a little unnerving to step into its past. It offered another chore for the young maid complaining about wiping tall windows while Donatella removed furniture covers and thought of her mother sitting there, writing more letters than she ever received. Donatella felt a shiver that shouldn’t have surprised her, the bumping and cursing of the movers fading into music and poetry from La forza dell’amor paterno as performed at the Teatro Falcone on Christmas Monday 1678. She had worn the green dress, agreeing to excessive curls and anticipation, Nonna encouraging her to fan away smoke from the chandeliers and smile although her shoes pinched. After the first act sonnets fell from garlanded boxes for those lucky enough to catch them; as much enthusiasm when the opera was finished. That was Donatella’s last trembling in applause and first glimpse of its beneficiary too remarkable for humility as he accepted a gold tray of the taffeta wrapped accolades. He was as well presented in a long shimmering coat with flared skirt, accented with a looped and knotted cravat, an undressed wealth of hair changing the angles of his face as he bowed and then again. Obviously this was the legend of subterfuge, here and there, elegant and rakish, kissing the hand of Centoventi, goddess of the stage. He was clever and foolish not to worry she took exception at his as intimate approval of the contralto said to be the daughter of a cook, nothing but wisdom and faithfulness in his deepest bow and sincerest smile towards Genoa’s Prince and Princess. Even overlooked in the audience, Donatella felt he was a suitor offering the art of himself. So at least in the theater she could be chosen. Nothing more intimate was expected, and shouldn’t be. Not even when their landlord, one of the Falcone’s managers, announced that Signor Stradella would be moving into their quiet world. And unquiet hearts, resentment sounding in Signor Garibaldi’s teasing. Like offering the pigeons to the cat! Aunt Despina couldn’t resist. It was assumed Signor Stradella would use the apartment for composing as well as sleep and light refreshments. Otherwise he would be out for tutoring and rehearsals during the day and church performances on Sundays, his evenings planned and unplanned with meals and diversions in more and less respectable settings. Two large but struggling men maneuvered in a long walnut trunk with brass filigree corners and latch. They stood looking down the embossed hall to its sun-splashed end. “Should we leave it here?” one of them asked. The men grumbled, did as they were told, then left, returning with musical instruments, a pair of trestles, square board, small stool, and a plainer case rattling with poorly packed contents. The apartment was already furnished, not with the Garibaldi finest, but bees-wax polishing gave console tables, armoire, credenza, and bed posts a higher shine. By the time citywide bells announced the vespers hour, Nubesta was done and resting on a frayed settee without any guilt for Donatella reaching over her to wipe the beveled mirror above. The movers were less irritated as they brought in one crate dropping heavy and another floating to the floor, talking about where they would go drinking. Nubesta followed them out to be sure they were gone. “Look.” Donatella untied a note from around the handle of the fancier trunk. “Not such a gentleman,” Nubesta hoped. The trunk’s carved exterior was scarred and the latch almost fell off when Donatella popped it to fold back the top like a book she shouldn’t read and hadn’t any reason to beyond the first page, the noted bedding on top. She relied on Nubesta’s willingness to go through Signor Stradella’s things that were neatly layered and smelled of parchment and resin; no surprise that he owned the finest neckties, cuffs, shirts, jackets, breaches, dressing gown, ribbons, kerchiefs, gloves, stockings, belts, and buckles, and silver instrument strings unwrapped from a silk-velvet cloth. Nubesta dug a little deeper, discovering two rosaries with gold medals, and a religiously embroidered runner with pointed ends and silk tassels. It seemed a shame to strip already made wealth for grey hemp and brown wool, squeezing a plump pillow like the best sausage meat into a thin and tasteless casement. They pulled the sheets tight, laid out the yarn-hemmed blanket, finishing with a swollen brocade cover-up, the room ready or not for its distinguished if disreputable new occupant. It was the second adjective Nubesta seemed to know the most about, as servants often did, talk amongst themselves both informed and ignorant. “Another note.” The girl tugged at it. “For a prize?” Nubesta squirmed, waiting for Donatella’s next move. Nubesta obeyed sluggishly, the late afternoon warming the room’s new belongings, the key Donatella tied around her arm under her sleeve too prominent to forget there. There was music in the house, not entirely imagined. Mama was playing the spinet and singing a little like Nonna, but with less exclamation than anticipation. She stopped as the clock in the front hall chimed half-past six, and called her husband and daughter to supper. For the second time that day she insisted on more fatty meats than soggy vegetables accompanied by glazed breads and followed by sharp cheeses as well as a fruit tart layered with thick cream or a pudding made with raisins, cloves and dates. Such a heavy meal late in the day, but Mama believed, as many Genoese did, the digestive powers were stronger during sleep. Was it the confinement of English rain and consolation of English suppers that changed her from being a woman worried over losing her looks and lover and willing to sacrifice for both, into one who wouldn’t even give up a second and thicker slice of roast beef? “Little bread … cheese,” Donatella struggled with three words as if they were ten. Donatella’s father raised another issue with his eyebrows. The Captain didn’t react to his wife, but vaguely smiled at the little maid who needed something to do. In his company, Lidia was deaf and dumb and lowered her eyes, perhaps reminded of her own father lost at sea although he still lived on it. She did glance at Donatella, who was her confidant in feeling awkward and out of place. It wasn’t long since they had disembarked the cutter bringing more mail sacks than passengers from Calais, and stumbled tired and dirty into a weeping sky and welcome by Donatella’s mother. A friendly sailor was trusted with their trunks but not the cage purchased in Marseille, which Lidia carried until the Captain met them on the pier with a thin-wheeled wagon. He covered the cat cargo with his own coat, Mama’s Italian chatter compensating for his silence as they walked to the inn where they would catch the coach to London. A snowy stag on The White Hart’s whining sign encouraged him to finally say something, if only to quickly explain and wait for his wife to translate that ‘hart’ was an ancient term for a mature male deer. There wasn’t time to explore the castle presiding in falling clouds behind the town, but at least it was more distinct than on its chalky pedestal in a foggy first view from the channel. A few hours were enough to have an early dinner under low-timbered ceilings and near a brass laden fireplace, Mama devouring half a roasted chicken and a glass of port wine, the Captain savoring a minced-meat pie and kegged ale. Donatella and Lidia shared a platter of steamed oysters with the cats and each other, as though they hadn’t had enough of the sea. If they had known how estranged they would soon be from it, the Captain wouldn’t have seemed irresponsible insisting on one last look at Dover’s harbor before the coach arrived with only ten minutes to spare for loading passengers inside, luggage on the back and hardier riders than they were on top. Donatella and Lidia held the heavy carrier between them, Caprice and Bianchi quietly but pitifully complaining about their prolonged captivity. Mama sat next to Lidia and the Captain opposite her, a frail man and sizeable woman squeezing in to his side. Everyone was guarded, with limbs touching, body odors mixing, and coughs possibly infectious. It didn’t help that Lidia, Mama, and Donatella saying anything to each other pronounced them foreigners. Fortunately, Donatella was next to the window and set her sight on stretches of woods and clusters of cottages, spired churches, the approach of towns and the clutter and curiosities of their streets, and even a cathedral where the couple got off and no one got on. The vacancy they left was just wide enough to allow the caged cats their own seating, but not for long. Before leaving Canterbury, the coach made another stop to pick up two musk-scented men who didn’t seem to notice the inconvenience they caused. They stayed overnight in Cheapside, the promised carriage arriving on time early the next morning. It made for a quicker and friendlier journey, and smoother, too. As the Captain pointed out, steel springs meant less bumps and jolts, while glass windows fogged but didn’t leak. A little over a week later the rain was still falling. Donatella lost track of the days since she had seen the sun. “Must I go out?” Donatella continued to resist her mother’s plans. Lidia began clearing the table. Mama made a noise between a moan and a scream before pulling Lidia into a maternally tight embrace. Donatella was as embarrassed as Lidia, but not surprised. Lidia offered a timid response. “I think she wants to help.” The Captain pushed back his chair. Lidia made the sign of the cross and Mama moved towards the mystified girl again, just catching her hand this time. “Perhaps, Martha, it’s even worse that a bad Protestant pays you.” The Captain’s face was redder than usual as he left the room. narrated by the same voice-over actor, Laura Jennings! The reviews have been coming in for To A Strange Somewhere Fled, sequel to A House Near Luccoli! See many of them here. Thank you to all who have read and are planning to read it. If you have not yet purchased it, I hope the very favorable reviews will be an enticement for you to do so. Thank you to Casee Marie of Literary Inklings for this BEAUTIFULLY expressed, generous, in-depth, and insightful response to the novel. I feel like she has looked into and validated my soul. You can read the review below, but I strongly urge you to follow the link to Literary Inklings, a showcase for the grace and excellence Casee puts into everything she does, and her dedication and contribution to the promotion of authors and their work, even mostly unknown ones like me! In her follow-up to A House Near Luccoli author D.M. 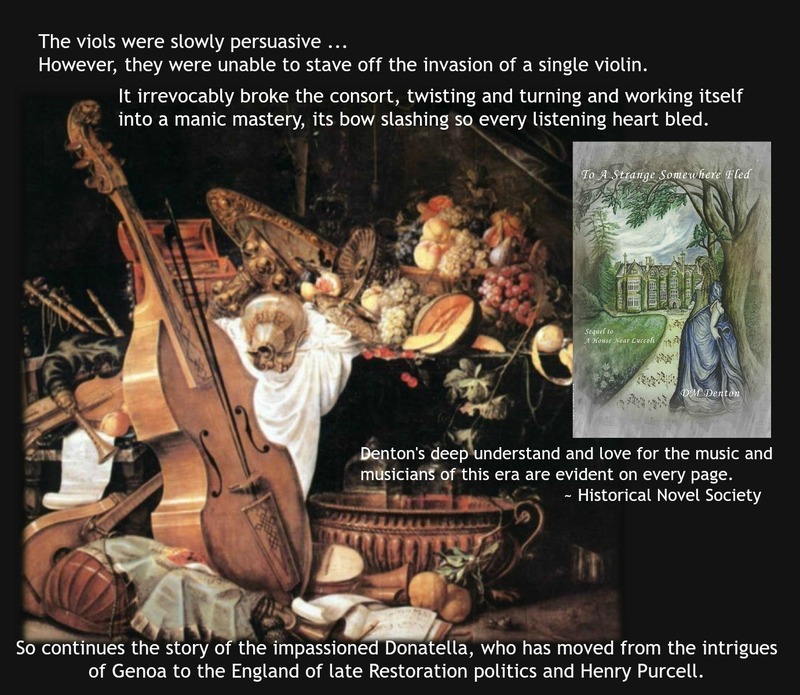 Denton takes readers back to 17th century Europe, moving the story of impassioned young spinster Donatella from Stradella’s Genoa to the England of Henry Purcell. One instantly remarkable element of D.M. Denton’s fiction is her unique blending of history and fiction; such was the backdrop for her 2012 novel, A House Near Luccoli, which introduced a memorable fictional protagonist – Donatella – to one of Italy’s most enigmatic composers, the roguish Alessandro Stradella. This strength of Denton’s is played upon in Luccoli’s sequel novel, To a Strange Somewhere Fled, which finds a heartbroken Donatella amid a cast of decidedly English characters plucked with utmost authenticity from the resonance of history. After tragedy struck in Genoa, Donatella joins her family in her father’s native England, trading the majesty of the Mediterranean for the unruly weather and unusual society of Oxfordshire. Despondent and bereft, Donatella suffers renewed sadness as she comes to terms with her new life as a foreigner in a strange land, struggling to replace her native Italian with the confusing language of the English and ultimately learning to adapt to their ways. Even as Donatella is haunted by the memory of Stradella – whose charming and often mischievous presence seems to have followed her, along with several never-performed copies of his compositions, to England – the determined heroine, expecting to resign herself once more to spinsterhood, finds unexpected emotions and, gradually, a new adventure awaiting her. From neighbors charming and catastrophic to an invasion of Italian musical greats, and even an appearance by the celebrated Henry Purcell, Donatella is soon buoyed between her own grief and the alluring, irrepressible pull of creativity. Almost all of the immediate characters in the story, with the exception of Donatella’s family and one or two others, are rooted in history, and the author shares her insights with the reader in a well-organized collection of historical notes at the back of the book. With this novel, Denton takes her fusion of history and fiction into an even deeper territory, depicting not only composers of British and Italian nationality, but also female singers and even men of law, such as the story’s male protagonist, biographer and lawyer Roger North. With sublime grace and devotion, Denton marries the two worlds together to form a setting for her novel that’s nothing short of enchanting. Keeping true to A House Near Luccoli, much of the foundation of this novel relies heavily on music as expression. The cadences and temperaments of compositions are reflected in Denton’s pacing as well as her confidently executed freedom of narrative: some scenes that would traditionally be laid out in show-stopping dramatics may happen quietly, maybe even outside of the narrative completely; revelations are made, characters introduced, and emotions uncovered with unexpected swells and surges of expression. As a result, Denton’s writing is as beautiful and complex as the music she effectively seeks to honor. And while Donatella and her story, full as it is of such a legion of colorful characters, are vastly entertaining in their own right, often Denton’s descriptions of musical performances manage to swoop in and lift the reader up to even greater heights. Her passionate research and personal love of the art both shine through in the remarkable imagery her prose evokes, enrapturing her audience and taking them just a bit deeper into the intricacies of the 17th century setting. Irrevocable in its magic and intrepid in its storytelling, To a Strange Somewhere Fled is a fascinating and delectably original work that readers won’t soon forget. Review © Casee Marie, originally published on LiteraryInklings.com.